President Donald Trump’s demands for loyalty from the individuals in his administration have been a hot topic for weeks in U.S. media. But what the media has yet to explain is how so many law partners from global corporate law firms that were outsized donors to Hillary Clinton’s presidential run last year, giving crumbs by comparison to Trump’s campaign, now hold seats of power throughout the Trump administration. Let’s start with the weirdest example of all: Jones Day. Wall Street On Parade reported earlier this year that on January 20, 2017 – the very day of Trump’s inauguration – Jones Day announced that a whopping 12 of its law partners were moving into the Trump administration. Among the 12, key slots went to Donald F. McGahn II as White House Counsel; Noel Francisco, first named as Principal Deputy Solicitor General and now Trump’s current nominee for Solicitor General; and Chad Readler, Acting Assistant Attorney General for the Civil Division of the U.S. Justice Department. For a cool dozen of one Big Law firm’s partners to simultaneously move into a new President’s administration is itself noteworthy. But equally noteworthy, the majority of partners of that particular law firm really didn’t like Trump. They wanted Hillary Clinton to be the President. As Bloomberg News reported on March 16, “…Jones Day’s lawyers contributed only $7,422” to Trump’s campaign, as reported by the Center for Responsive Politics. “That compares with $267,899 given to Hillary Clinton’s campaign,” according to the article. Wall Street had to be very happy about the density of Jones Day partners in positions of power. The law firm’s clients include Goldman Sachs, Citigroup, JPMorgan Chase, Wells Fargo and Deutsche Bank according to its official client roster. We also reported that “In addition to the more than $900,000 that went to the Hillary Victory Fund, tens of thousands of dollars more were donated by Sullivan & Cromwell lawyers to Hillary Clinton’s main campaign committee, Hillary for America.” Among Hillary’s biggest fans was the Senior Chairman of Sullivan & Cromwell, H. Rodgin (Rodge) Cohen, who donated $285,000 between May and June 2016. The SEC has been heavily criticized for failing to promote dedicated career staffers rather than utilize the revolving door from Wall Street’s Big Law firms. But this has continued in the Trump administration. On May 9, the SEC announced that William H. Hinman, a recently retired partner from Big Law firm Simpson Thacher & Bartlett, would become the Director of the SEC’s Division of Corporation Finance. On May 15, the SEC named Robert B. Stebbins as the new General Counsel. Stebbins comes from another Big Law firm, Willkie Farr & Gallagher where he had practiced for more than two decades in the area of mergers and acquisitions, private equity and venture capital, among other focuses. On May 12 a letter was made public that had been written in March by two tax partners from Morgan, Lewis & Bockius, Sheri A. Dillon and William F. Nelson. 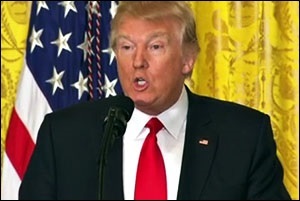 The letter stated that they had served as tax counsel to Donald Trump and the Trump Organization “continuously since 2005.” The letter was an attempt to tamp down the media frenzy concerning Trump’s entanglements with Russia. That effort was somewhat diminished when ABC News pointed out that Morgan, Lewis & Bockius was named “Russia Law Firm of the Year” in 2016 by Chambers & Partners. The same political donation pattern occurred at Morgan, Lewis & Bockius with lawyers at the firm giving heavily to the Hillary Clinton campaign and her joint fundraising committee, the Hillary Victory Fund, while Trump received negligible political campaign support from the firm’s lawyers and staff. Three key questions arise from this saturation of Big Law involvement in the Trump administration. How did a candidate like Trump, who ran on a populist message of draining the swamp in Washington, end up surrounded by global corporate law firms of massive size and reach? Why doesn’t Trump see the law firms’ outsized political support to Hillary Clinton as failing his loyalty test? The final question is how a President with so much high-priced legal talent could be in so much legal trouble this early in his Presidency. Wall Street veterans may have the answer to the last question. There is a maxim on Wall Street that when the lawyers take over, it’s all downhill from there. Typically, that’s because lawyers prize confidentiality and opacity while the public prizes openness and truth.